1. Please explain the design brief for the project. Food market is one of the first departments in a 15 year old shopping mall, Laemtong, Rayong that undergo the major renovation. 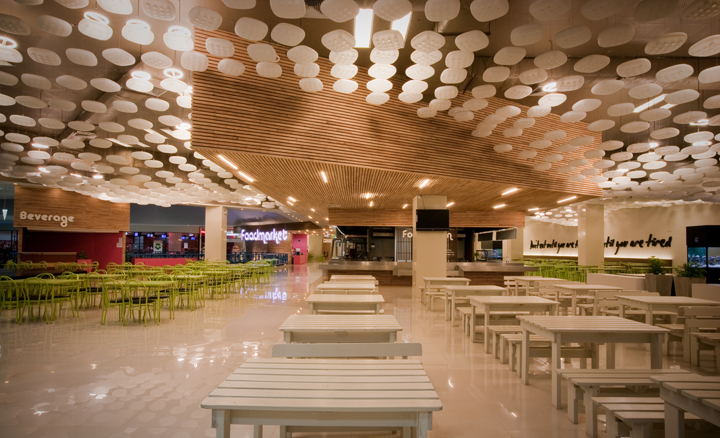 The 1,400 m2 Food hall accommodates 16 local food shops and 400 seats. It is one of the pioneer projects for the owner to upgrade and re-brand his shopping malls in different provinces. 2. What makes your design unique ? The high level of “appropriating the elements”, 40% of the components are re-used items transformed and refurbished to match the new space. 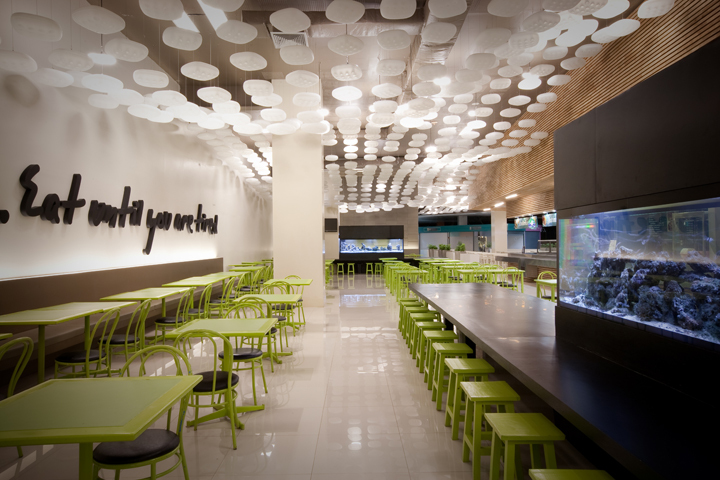 All tables in the food hall are old ones repainted with the new thematic color as well as 70% percent of the chairs. All cooking components in the stalls are refurbished items. 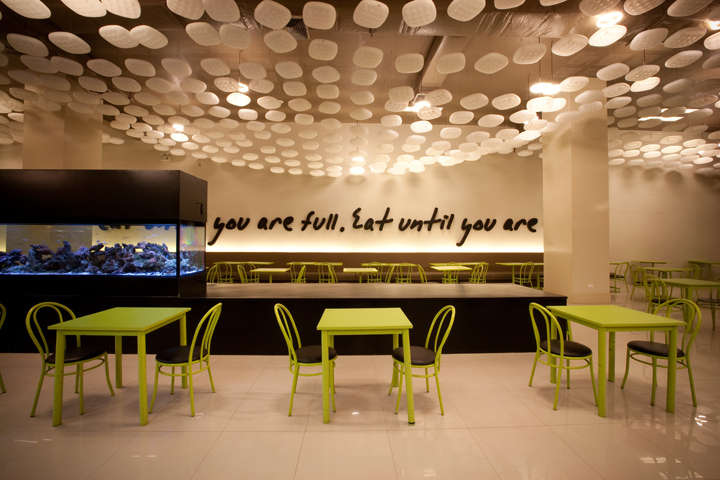 Not just reusing, there is also a redefining the meaning of dining furniture in the project. 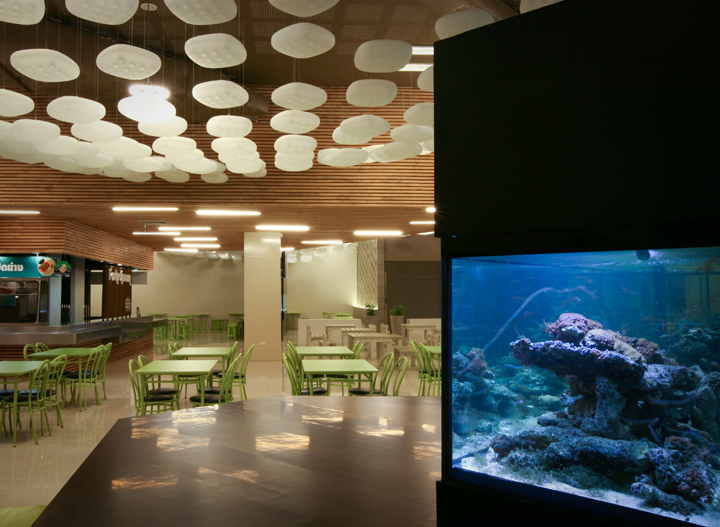 The 4 aquariums in the dining area behave that they are part of the eating activities. They melt together with tables to become communal dining seats where sea-lives become the highlight of that particular dining space. 3. What constraints (in terms of site, budget, etc.) were imposed on the project ? How did you overcome those constraints ? What design features highlight those efforts ? “Locality”.. the fact that it is a project not for metropolitan context, but for a mainstream mass in the provincial city, to introduce alienated installation such as waveform ceiling has to be done appropriately otherwise it becomes obsolete for the locals. The owners’ budget limits the selections of furniture. The main policy is to re-use the existing items as much as possible. Introducing the gigantic chandelier in waveform is mainly to help to create different types of dining space defining by its cave-like surface. One big dining area is divided into smaller hall with different heights. 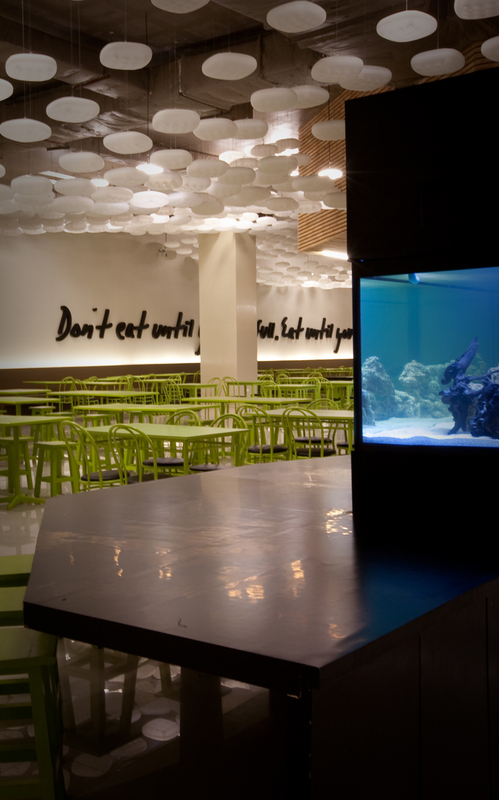 The goal is to push low cost construction to generate diversity in the typical dining activities. 4. 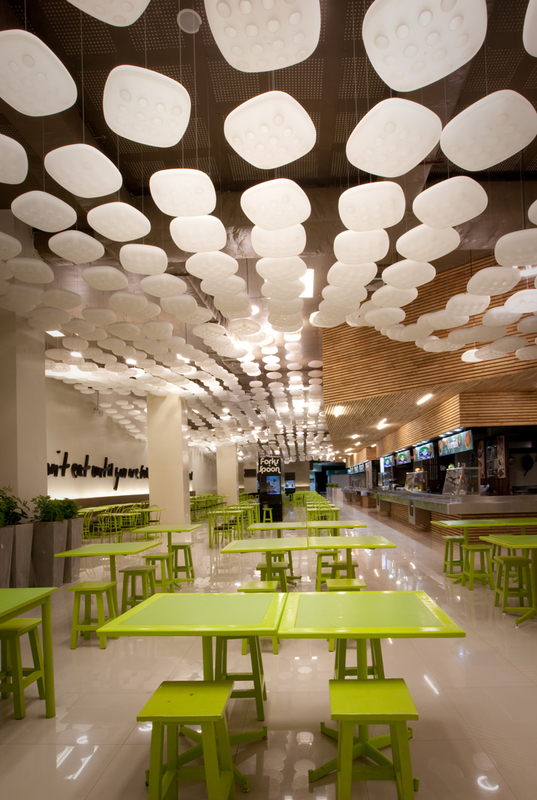 Why the use of plastic modules for the ceiling; what is the design concept behind it ? 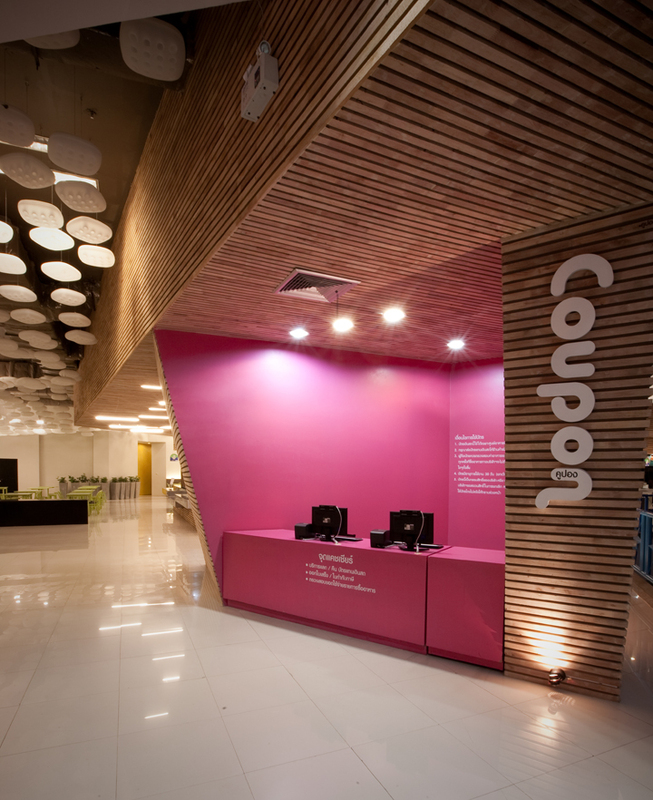 I think interior design is not only about creating space using given material we find in the market but in fact we have to find chances in projects to manufacture it by our own to get interestingly unique components. By define it to the right scale 50×50 cm. we would need to have 5,000 units of translucent ceiling modules to cover 1,400m2 space. That quantity is enough for us to produce them with the real industrial process; injecting molded plastic. 5. What do they mean by “creating a waveform space” ? 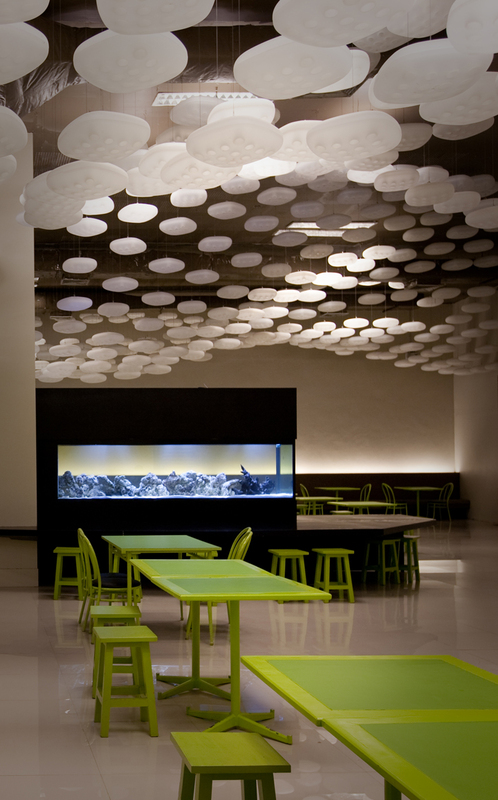 The ceiling installation includes 2,500 hanging points where each of them hung 2 units of ceiling modules. The lengths of the hanging wires are almost all different so that in all, it creates a wave-like surface above the dining area. 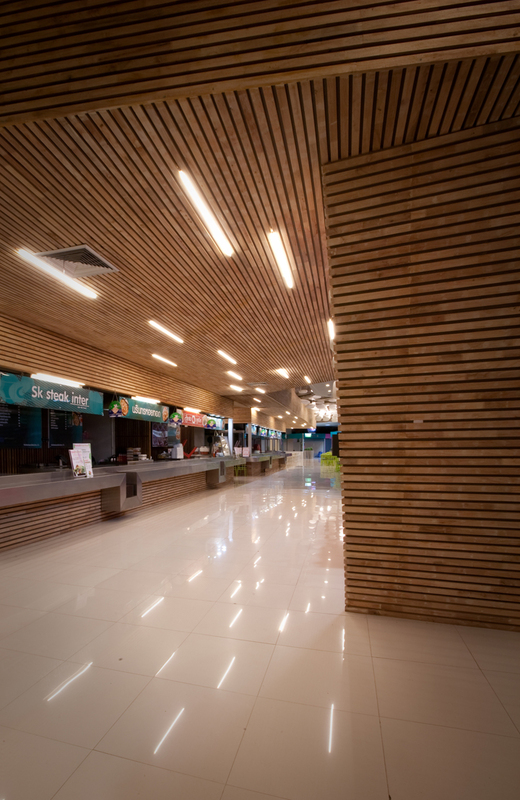 This entry was posted in 2007-Food Market Rayong, Interior Design and tagged food center thailand, food market, laemtong rayong, laemtong shopping, pitupong chaowakul, supermachine studio. Bookmark the permalink.